The US Supreme Court declined to hear an appeal from a conservative group seeking to end a campaign finance investigation into Wisconsin Governor Scott Walker’s recall campaign and its possible involvement with independent groups in 2011 and 2012. Monday’s decision in O’Keefe v. Chisholm leaves intact an appeals court ruling from September that said the conservative group Wisconsin Club for Growth and its director, Eric O’Keefe, must resolve their claims in state court. O’Keefe and WCG argued the investigation was a violation of their First Amendment rights and an attempt to criminalize political speech. The investigation included armed raids on homes to collect evidence. In its September ruling, the appellate panel said that the government is entitled to regulate coordination between campaigns and purportedly independent groups, despite the First Amendment’s protection of truly independent expenditures on political speech. “If campaigns tell contributors to divert money to groups that have agreed to do the campaigns’ bidding, contribution limits become porous, and disclosure requirements become useless,” Judge Frank Easterbrook wrote for the court, according to Courthouse News. In May 2014, a federal judge stopped the probe after O’Keefe’s group filed a lawsuit accusing investigators of sidelining it from political activities and violating its rights to free speech, association, and equal protection. That investigation is on hold while a separate legal challenge is pending before the Wisconsin Supreme Court as to whether the alleged actions violated state campaign finance laws. The so-called “John Doe investigation” allows prosecutors to gather information to determine whether a crime has been committed and who may have been involved. In an amicus brief filed by the Brennan Center, the group said that in addition to O’Keefe’s group, Walker’s other backers “reportedly spent millions in support of the election campaigns of four of the state’s Supreme Court justices, who are now hearing a constitutional challenge to the John Doe investigation. 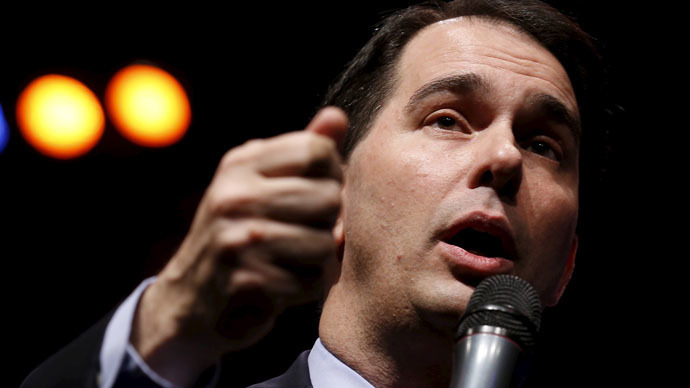 A previous John Doe probe resulted in the conviction of six of Walker’s aides. Walker is seen as a rising star in the Republican Party and is serving his second term as Wisconsin’s governor after winning re-election in November 2014. In a related story, Wisconsin’s Democratic lawmakers are calling for a federal investigation into Governor Walker’s job creation agency after a newspaper reported the organization made a loan to one of his top donors five years ago. The probe, announced on Monday, is into a loan made by the Wisconsin Economic Development Corporation, a private-public partnership job creation agency that replaced the state Commerce Department. The agency has had a troubled history and audits revealed that it has suffered from extensive leadership turnover and mismanagement, and failed to track past-due loans. Walker created the agency when he began as governor in 2011. At the center of the query is the Wisconsin Economic Development Corporation's loan of $500,000 to William Minahan, who headed a now-defunct construction company. The company was to outfit bank and credit union buildings for more energy efficiency, but the company created no jobs and didn’t return the loan. The state sued and won a judgment against the company. Minahan had contributed $10,000 to Walker’s gubernatorial campaign in 2010. On Friday, after the Wisconsin State Journal’s story on the issue ran, Walker asked legislators to restructure the agency by eliminating the loan program. Walker, when reached by the Associated Press in New Orleans, told the news outlet that he played no role in the loan and that Democrats are on a “partisan witch hunt.” He said his restructuring request had nothing to do with the Journal's story.